For the convenient long range communication we offer different satellite radio devices for permanent fixed installation or as hand-held radio for the major Sat-Com networks. Certainly we will assist you in the process of registration at the service providers. Typical users are those, woh are operating outside of local telecommunication infrastructures and networks, e.g. vessels at sea, oil-platforms, expeditions, security staff operating overseas, rescue and civil defense organizations, development aid agencies and NGOs. Available are plenty of services, such as voice, data, e-mail, browsing the Internet, remote control of distant facilities etc. The Sat-Radios of the Explorer-Series are a compact BGAN system for landmobile communication in remote or disaster-affected areas, where no local telecommunication infrastructure exists (anymore). The system consists of three fully integrated units – a transceiver, an IP handset and an antenna, easily to install with magnetic mounts. 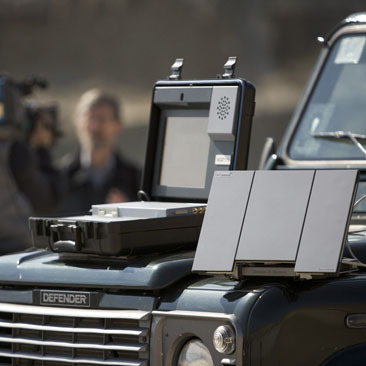 Whether you’re engaged in security, rescue, civil defense, disaster management or humanitarian operations in NGOs, as well at fixed locations, such as embassies, refugee-camps or research-stations, you will need an easy deployable communication device you can always rely on, in order to perform you mission-critical commo. Choose EXPLORER for cost-effective vehicular internet connectivity, video streaming, voice communication, e-mail and even VPN access. With EXPLORER-Series you are able to connect to the world via voice or data over Inmarsat BGAN instantly, even when your vehicle is moving. It enables BGAN data speeds up to 384kbps standard IP and up to 128kbps streaming, and operation down to 5° elevation even when moving off road or on heavy terrain. You can be connected with your base, headquarter or mission control center at any time and any place. Access your e-mail accounts, browse the web, make user of Team-Viewer or VPN for remote control of distant facilities; with fixed pricing and no roaming charges when you cross borders. Attention: Information on that topic will follow up soon!